This recipe is for about 20 pounds of crawfish. When we have big crawfish boils, we’ll usually have 3 pots going and use the same measurements below in each pot – for our pots, we ordered this: King Kooker 1265BF3 Portable Propane Outdoor Deep Frying/Boiling Package with 2 Aluminum Pots (which happens to be an Amazon best seller and a killer deal). We recently did a crawfish boil with sausage, potatoes, corn on the cob, shrimp, and crawfish. We had 45 pounds of crawfish, about 5 pounds of sausage, and roughly 6 pounds of shrimp, and that was enough to have a bit of leftovers the next day after feeding 30 people dinner. I can eat about 2 pounds of crawfish to myself and my husband can eat 8-10 pounds. The amount of crawfish you’re group will eat will depend on the eaters – how much can they eat? 2 OnionsSliced, and keep skins to throw in pot as well. 2heads GarlicTop part sliced off, and keep the skins to throw in the pot. 1bag Crawfish, Shrimp, and Crab BoilThis is a 3oz mix of seasonings and spices in a bag, including mustard seed, coriander seed, cayenne pepper, bay leaves, dill seed, and allspice. 1stick MargarineI know, I’m not a big fan of margarine either, but I’ve always been told that this recipe ONLY works with margarine. 1bag Red PotatoesI pick the small red potatoes because they’re bite size. 3 Corn on the CobSplit in half to make 6 pieces. 1lb SausageIf it’s precooked, you can go ahead and cut them up, but if they’re fresh, keep them in their casings. You’ll want to work in a really large crawfish pot. The one I usually use is 30 quarts. Place in the pot your strainer – the larger pots usually come with one. Then add the oranges, lemon, onions, garlic, crawfish boil seasoning bag, concentrated crawfish boil juice, margarine, 2 tbls chicken base, and 1 lb of crawfish boil seasoning. Add enough water to be about 2 inches below the rim of the pot. Cover the pot with a lid, and place the pot on your outdoor burner and turn on high to bring the broth to a boil. Plan on boiling the broth for 1-2 hours, at least. For purging your crawfish, see above. As the broth is simmering, let’s make the garlic butter sauce that will be poured over the cooked crawfish boil mix. Put a stick of butter in a pan and bring to a boil. Mix in the minced garlic head and cook the garlic for a minute or two. Turn off the heat and add in cayenne, lemon pepper, paprika, and chicken base. Set garlic butter aside for after crawfish is done. After the crawfish broth has boiled for an hour or two, it’s time to start throwing in your add-ins. Potatoes take the longest time. If you are using the small red potatoes, add an additional 15 minutes of cook time. If you’re also cooking with raw sausage – instead of precooked – go ahead and add those in at this time too. 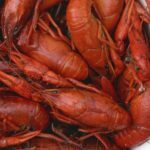 After the 15 minutes of the potatoes cooking, throw in the rest of the crawfish boil ingredients – sausage, crawfish, corn, and any other crawfish boil favorites (see list above for more ideas)! Let the crawfish boil for 10 minutes. Turn the burner off and let all of the ingredients sit, covered, for 15 minutes. After the crawfish boil sits, it’s time to remove them from the pot and put them in a container to steam for another 15 minutes. If you ordered your crawfish, you can use the rinsed out, and cleaned container they came in. If you have a cooler, that works just fine too. When you remove the crawfish boil ingredients, add a little to the cooler, sprinkle on some Tony Chachere’s and Old Bay. Lay down another layer of crawfish boil ingredients, sprinkle on more seasonings. Keep doing this until all your ingredients are in the cooler. Grab your garlic butter, and pour it on top of the crawfish boil, close the cooler lid, and let the mix steam for 15 minutes. Cover a table with plastic table cloth and/or newspaper, pour the crawfish boil out on the table, and dig in! No need for any silverware or utensils, but you may want a roll of paper towels near by. For how to eat crawfish, see above.